The Professional Regulation Commission released the 414 out of 771 passed the Chemist Licensure Examination given by the Board of Chemistry in Manila this September 2015. The said exam was administered by the members of the Board of Chemistry, the following people who gave the licensure examination are Ms. Adoracion P. Resurreccion, Chairman and Ms. Soledad S. Castañeda, Member. 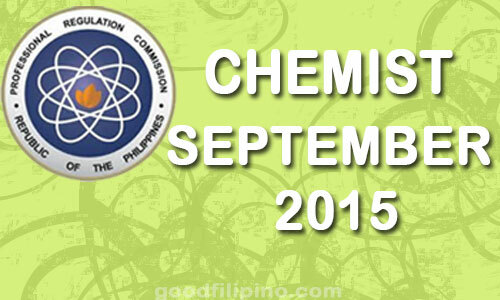 Chemist Board Exam Results (September 2015) was released in one (1) working day after the last day of examination. PRC said, those who failed to pass the board examination for Chemist but had obtained a rating of at least 70% in any two (2) subjects can register as Chemical Technician. In Addition, the date and venue for the oathtaking ceremony of the new successful examinees in the said examination WILL BE ANNOUNCED LATER. Comments or suggestions about "September 2015 Chemist PRC Board Exam Results - List of Passers (September 2015)" is important to us, you may share it by using the comment box below.